ITALIE – – Cividale - Graves unearthed in the northern Italian region of Friuli over the last several days held objects belonging to ancient Lombard warriors. 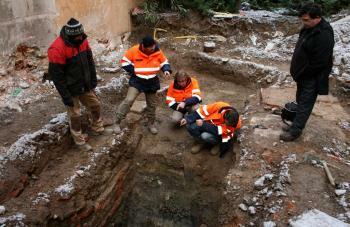 Archaeologists excavated the tombs of men, women and children, some of which showed signs of past intrusions. Spears, swords, knives and bags containing coins and other iron objects were found in the men's tombs while combs and clips were found in the women's. 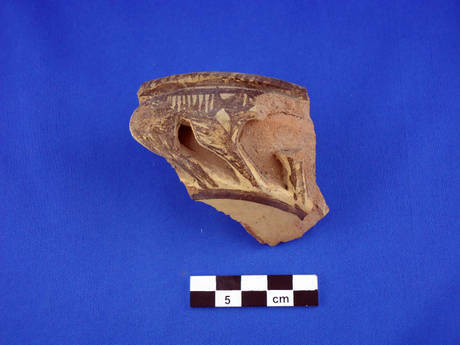 In most cases, ceramic vases had been placed at the foot of the graves. At the center of the necropolis was the tomb of a veiled woman with a bronze clasp pinning the cover to her head and a gold-embossed cross placed on her chest. The 30 tombs compose one of the largest Lombard cemeteries discovered to date, including those unearthed in the late 19th and early 20th centuries said to contain Lombard aristocracy and other graves found nearby in the 1960s. Local authorities have set up surveillance in the excavations as archaeologists continue to recover objects for transfer to the town's National Archaeological Museum. MEXIQUE – 'Homún - Découverte intéressante près de Chichen Itza. Des archéologues-plongeurs ont sondé un de ces trous d'eau dans le municipe d'Homún. A 35 mètres de l'entrée, l'équipe dirigée par Sergio Grosjean Abimerhi a pu localiser vaisselles appartenant à des époques différentes : la majeure partie sont préhispaniques, d'autres sont de l'époque coloniale. La plupart a été intentionnellement perforé et lancé afin de symboliser leur mort symbolique. FRANCE – Moissac - Les équipes de l'Inrap ont mis au jour des vestiges millénaires sur un chantier. Des découvertes inédites qui renseignent un peu plus sur la vie quotidienne des premiers moissagais et sur le visage des premières habitations. Des os, justement, l'équipe de l'Inrap en a trouvé quelques-uns dans ce chantier de réhabilitation du centre ville comme des restes d'animaux, des reliefs de nourritures, des brindilles ou des graines. Mais ce ne sont pas ces trouvailles qui provoquent l'intérêt des archéologues. Ces derniers sont autrement plus excités par des « trésors » arrachés à la terre. En une matinée, une semelle en cuir et un bec verseur de carafe sont par exemple mis au jour. Ce n'est pas tant la valeur financière de ces découvertes qui compte, mais plutôt leur inestimable intérêt patrimonial. « C'est la première fois que l'on fouille en dehors du périmètre abbatial, explique Laurent Sevègnes de la direction régionale des affaires culturelles (Drac), et là nous sommes dans une des premières zones d'habitation de la ville. » Y avait-il une vie avant l'abbatiale ? Ce chantier pourrait livrer la clé. Et renseigner sur la vie quotidienne des Moissagais d'il y a 1 000 ans. « Dans un contexte normal ces signes de vie disparaissent, précise Patrice Georges de l'Inrap, mais nous sommes en présence d'une couche de terre tourbeuse qui conserve des éléments organiques. » Un géoarchéologue, spécialisé dans l'étude des sols, a été appelé en renfort pour effectuer des prélèvements qui permettraient d'affiner la datation des découvertes « à 100 ans près. 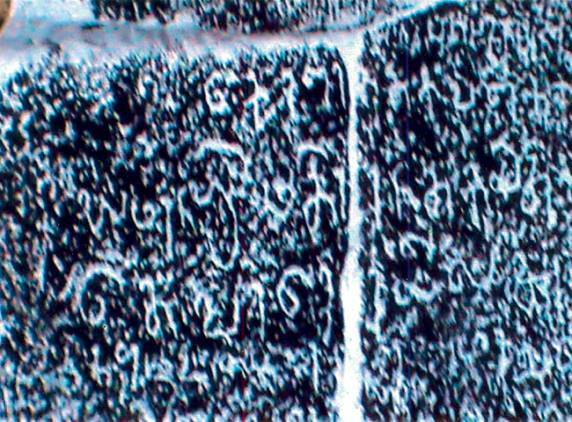 INDE – Panchapatti - An ancient inscription from a damaged temple, dated back to Chola period, has now been found in Panchapatti in Krishnarayapuram taluk. According to Archaeology and Inscription Association member K. Balasubramanian, the Siva temple was built during the reign of King Rajendra Chola who is also known as Maduranthankan. The northern side of the stone temple has suffered a heavy damage while a neem tree has grown amidst stone-wall on the southern side. There were two Dwarabalakas on the eastern side of the temple. One was found in a standing posture while the other was found lying fallen on the ground. According to the inscription found on a damaged stone block on the eastern side of the temple, the temple was built during the period of King Rajendra Chola, son of King Rajaraja Chola, and the village was then known as Panchanur while the temple was called Sri Maduranthaka Eswar temple, Mr Balasubramanian said. As King Kandaraditha Chola’s son Maduranthaka was a little boy, Kandaraditha’s younger brother Arinjayan ascended the throne. Later, Arinjayan’s descendants Sundara Chola, Rajaraja Chola and Rajendra Chola ruled the kingdom. Realising the fact that Kandaaritha Chola’s son Maduranthaka could not ascend to the throne, King Rajaraja Chola named his son Rajendra Chola as Maduranthaka. Rajedra Chola, in turn, built the temple in memory of Maduranthaka and named the temple as Sri Maduranthaka Eas-warar. The people of Panchapatti were known to be cotton cultivators and sold cotton. 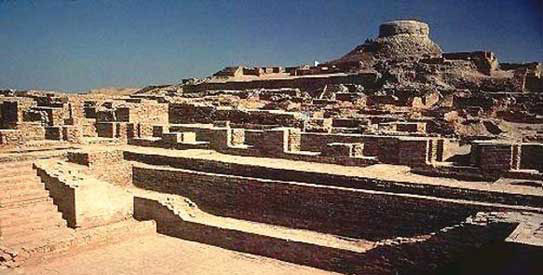 PAKISTAN – Moenjodaro - The executive board of the National Fund for Moenjodaro (NFM) decided to develop a master plan for the preservation of the pre-historic site with the assistance of Unesco. The plan will be presented for further deliberations and fund raising in an international symposium scheduled for December at Moenjodaro. NORVEGE – Melhus - Archaeologists have discovered a Viking sword on a construction site in Melhus near a believed burial site. 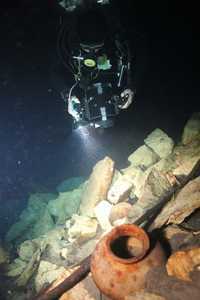 The ‘H sword’ is well preserved and experts are very enthusiastic about the discovery. NTNU Museum of Natural History and Archaeology archaeologist Anne Haug told NRK, “It’s extremely exciting, the sword has some remnants of wood and fabric, and it is very rare.” It is believed that the swords are in such good condition because they lay in clay underneath 1.5 metres of arable land. Several burial sites are known to be in the area, which were razed to the ground in the 1800s. TURQUIE – Yenikapi - The eight-year excavation of thousands of centuries-old artifacts unearthed during the construction of the ongoing Marmaray rail transport project in İstanbul’s Yenikapı neighborhood has been documented in book form by the İstanbul Archaeology Museum. Artifacts discovered at the 58,000-square-meter site date back to the late Ottoman era, the early Byzantine period and even Neolithic times. Among the finds at the site was the fourth century Port of Theodosius, which was part of the ancient Constantinople harbor of Eleutherios. In 2005, workers discovered the silted-up remains of a harbor that was constructed during the reign of Theodosius I and was the city’s major point of trade. Traces of an ancient city wall and the remains of over 35 Byzantine ships from the seventh to 10th centuries were excavated, as well as 8,000-year-old skeletons, which provided critical evidence suggesting İstanbul was home to the earliest Stone Age settlements.